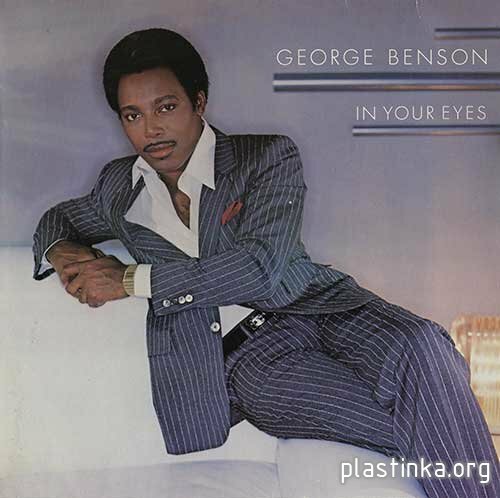 In Your Eyes is a 1983 album by George Benson. It is his only album produced by legendary producer Arif Mardin. It includes the hit "Lady Love Me (One More Time)". The title track would later be covered by Jeffrey Osborne for his 1986 album Emotional. In search of more platinum, Benson turned to one-time Atlantic Records ace producer Arif Mardin for support. Yet Mardin's best days seemed to be behind him, as this mostly routine package of period R&B backbeats, synthesizer rhythm tracks, and love songs indicates. Any competent soul vocalist could have fit in comfortably here. For jazz fans, Benson's albums at this point became a search for buried treasure, for his guitar time was extremely limited. But when you do encounter a Benson solo, hang on tight. "Love Will Come Again," otherwise a routine soul bumper, concludes with a magnificent solo in octaves that Wes Montgomery would have envied, breathtaking in its economy and swing. Also, check out the instrumental "In Search of a Dream" for proof that George Benson could still burn. Contains printed inner sleeve with lyrics. All tracks recorded at Atlantic Studios, New York, New York except A3 recorded at Music Grinder Studio, Los Angeles. Additional recording at Music Grinders, LA; United Western, Hollywood; Hit Factory, New York and Record Plant, New York. Track B5: © 1981 Dyad Music Ltd.
℗ 1983 Warner Bros. Records Inc. for the U.S. and WEA International Inc. for the World outside of the U.S. Manufactured in Germany By Record Service GmbH. Alsdorf. Pressé en Allemagne par Record Service GmbH. Alsdorf. Belgique/België: Distributed by WEA Records S.A./N.V. England: Distributed by WEA Records Ltd.
España: Edita WEA Records S.A.
Ireland: Distributed by WEA Records Ltd.
Italia: Distributed by WEA Italiana S.P.A.
Nederland: Distributed by WEA Records B.V.
последнюю без во-кала если б кто пожалуйста подкинул, музыка хорошая, а вот всё что с пением у него не люблю. vova56, я этот альбом скоро просто сам оцифрую, там выставлена не моя оцифровка. Так что постепенно усе будет.